1Although human nature itself is inclined to be compassionate toward the old and the young, the authority of the rule should also provide for them. 2Since their lack of strength must always be taken into account, they should certainly not be required to following strictness of the rule with regard to food, 3but should be treated with kindly consideration and allowed to eat before the regular hours. The concern here seems to be older brothers or children living within the monastic community. 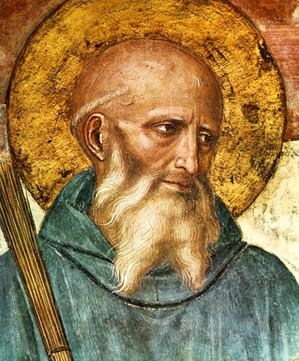 Due to their physical weaknesses Benedict uses the Rule to protect them from monastic burdens that they should not have to carry. Beyond children and the elderly, I think this concern for physical weakness and limitation is huge. It makes me think of how welcoming and inclusive our churches are to the disabled and handicapped. And I'm not just thinking here of the physical arrangements of our buildings, worship spaces, and classrooms. I'm also thinking here of our patterns of life, about how welcoming and accommodating and inclusive is our church life. For example, I was sitting next to Kristi at church. Kristi is blind, somewhat mentally disabled, and in a wheel chair. During church an announcement was made about our "Look Who's Coming to Dinner" activity, where people sign up to host or go to dinner where the people--host and guests--don't know who is coming. It's a way to get people at church, who might have never had a chance to meet, to form new relationships. Hearing the announcement Kristi leaned over and said, "I'd like to go to one of those dinners." But the hurtles Kristi would have to clear to get to go to one of those dinners is enormous. First, she needs friends at church. Not just people who pick her up and drop her off. She needs friends at church to help her express her wishes and get her signed up. From there, someone is going to have to pick Kristi up and take her to the dinner. From there, Kristi has to be able to enter the house and the dinner table needs to be set up to handle her wheelchair. Next, Kristi is going to need some help--because she is blind and a bit shaky when it comes to motor coordination--with her food. In fact, some food just might not be easy for her to eat. Spaghetti would be a nightmare. This affects the menu. Finally, it could be pretty disruptive for some people to have Kristi show up to one of these dinners. It's all a surprise, remember. Look who is coming to dinner! The casual vibe of visiting and sharing would be a bit...um...altered by having a blind, mentally handicapped girl show up in a wheelchair. Some people would be so discomfited that they would be unable to relax and enjoy the evening. The point being, how accommodating is "Look Who's Coming to Dinner" to someone like Kristi? This is no judgment of the ministry, just an observation to get us to think outside the box when it comes to our common life. Many great ministries and ideas are extraordinarily hospitable at their center but hard to enter into from the margins. Yes, Kristi coming to dinner would be quite the hurdle for all involved. Maybe it would be best if she wasn't a "surprise" attendee, but rather a planned for guest.